Tristitia are a swedish doom band, with a troubled and ever-changing line-up. The majority of their releases can be considered doom-death, but The Last Grief utilizes a different singer who has a clean, strong voice, greatly impacting the music. This turns out to be a welcome change. The Last Grief starts with a short story-establishing piece; Kane and the narrator Uziel become damned for their treachery, and subject to the perpetual torments of Hell, emerging from the other side of their tortuous eternity as maddened demons. After this brief mood-setting track, "In the Light of the Moon" opens with Galvez' romantic, classically played acoustic guitar rippling across light but moody synths, combining to create a short instrumental that evokes apprehension. "Slaughtery" introduces Bengtsson's throaty, operatic vocals which are impressively strong in such a low register. They swim through a gloomy, depressive song replete with slow riffing, time changes and surprisingly melodic guitar structure, until around 2:30, by which time the pace has accelerated to a more driving, rock-n'-doom style approach which leads into a foreboding yet rather heroic solo, eventually seguing back to the verse. This is a beautiful and well-written track which establishes the band's talent, focusing on Galvez' guitar wizardy and Bengtsson's beautiful, melancholicly strangled CLEAN vocals. Doom usually doesn't get this romantic without a touch of doom-death. Wipe your eyes and head to the next track, "Evolic", which rather reprises the sound of "In the Light of the Moon", but this time with added female choir-like vocals. This piece is a bridge between songs, and important to maintain the melancholic atmosphere of the set. "Golden Goddess of Fire" opens with a low, crunchy guitar note, and moves towards a rather Candlemass-inspired slow riff; Galvez shows that he is a master of timing as well as shred by subtly bending notes and delaying the piece, almost like the screams of Uziel as he burns. Drums enter eventually, along with Karlsson's voice which has taken on a more menacing, pained delivery. He gets the chance to soar occasionally, and does not disappoint. Fast pedalling here seems a little out of place, but adeptly performed. Tempo changes abound, adding complexity to the song without taking away its flow. A beautiful acoustic guitar piece interrupts the song, while electric wails hang overhead. At 4:00 a slow, crunchy riff enters, powered on by the intelligent drumming. Vocals lament and moan; it can be hard to make out the lyrics at times, but the sound of the voice is arguably more important in such a piece. All in all, this is a very complex, very stop-start style song with a rather unintuitive structure. Its secrets can be unlocked by concentration, and through dedicated, repeated listening. "Tears & Tequila" follows the song, acting as another short transition, based around a mournful guitar solo over some sombre acoustic patterns. So far, no bad points, and no drops in the mood. "Angelwitches Palace" opens heavily, but before long the mood has reverted to Galvez's signature electric wailing. Double pedalling is again present here, but this time the guitar shreds at a similar speed producing a pleasing and rather heavy passage. Around this point, you realize that you'll never be able to pin down any of these songs and give them definitive descriptions, as they change rhythm, pace and style so quickly as to be entirely unpredictable until memorized. This seems to fit with the album's concept, and adds up to a rigorous exercise for the mind as well as the ears. Themes from earlier songs are reprised in this seven minute track, but each proper song so far has had a unique motif of its own and a recognizable chorus. "Memory's Garden" serves to maintain the album's thick, almost cloyingly desperate style, introducing the track "Instrumental Hollowcaust." This is different; the bass drum blasts and the guitars tightly riff in a style reminiscent of Black Metal, in which the sequence of the notes is much more important than the talent of the performer. The pace drops back so that a solo can enter, and the chorus from "Angelwitches Palace" makes a brief cameo. As the title suggests, this track is devoid of vocals and is mainly a canvas on which Galvez paints in his inimitable style, cycling through all the themes that appear on the album. Most curious to have an overture in the middle of an album rather than the start, but then this band seems content to ignore all conventional structures. "Medievil" is another acoustic bridge, this time sounding rather like a folk song; cello takes over half-way through the piece, upping the melancholy ante. Each individual track up to this point has made sense in context with the album; it's actually rather exciting to hear an album so well constructed, even if it is intended to push you into a deep depression. "Under the Cross" follows, and sounds rather familiar to "Slaughtery", except the pace is maintained for longer; this is definetly the most conventional piece on the album, so you can consider it their ballad, of sorts. All in all, it sounds like Iron Maiden on morphine, which is meant as a high compliment. However, this wouldn't be Tristitia if the song was simple; choir interrupts the proceedings at around 2:45, intoning some holy but entirely indistinguishable words. Luckily, Galvez grabs his guitar and beats the monasterial choir away with a beautiful guitar solo, and the pace of the song is restored for a final verse. 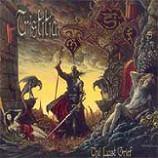 No segue this time; we move straight on to the final track, "Darknia: The Last Grief" which, truthfully, is quite familiar and similar to the previous songs, while still having some uniqueness of its own, mainly in the melody of Bengtsson's voice. This is not a bad thing, however; this album has a cohesive atmosphere, and a departure from the established feel would be a poor choice for a final track. Galvez throws in a rather heroic riff at around 2:30, and then briefly moves into neo-classical territory for a short solo, and follows that up by repeating the riff from earlier but with many harmonizing layered guitars. This is an epic break and I have to confess that it reminded me more of Blind Guardian than any doom band. Bengtsson's lyrics offer a conclusion to the tale, after which a steady, minor yet calm acoustic passage coaxes you back to the real world. Not for me though, as I always press play again. This album is incredibly immersive, and despite the extreme melancholy and the theme of grief and torment it is very addictive. If you are a fan of epic doom or of power metal, this album has plenty to offer you, although there are two stumbling blocks; one is Bengtsson's voice, which while distinctive, can be heavy-going. Secondly, this album works as one consistent piece; it is not a songbook, and should not be approached as such. Regardless, this is a masterpiece.